Private Pottery & Art Collection of Dena and Worley Faver. This is the home of Mr. & Mrs. Worley Faver. Usually if a collector agrees to publish a photograph of their home, I remove their address and name for privacy reasons. Here Worley’s pottery is showcased so beautifully, I’m happy that some of my paintings have found a special place beside his work in their home, and they allow me to share these with you. Worley together with his wife and muse Dena, have collaborated and decorated their home with Worley’s pottery vessels and works of art. They are a creative force and together have been hugely supportive of my career in fine art, introducing my work and showcasing my paintings in their St Augustine Gallery (from 2008-2012) until they retired from gallery life. They have promoted my paintings and also added a few to their personal art collection, two larger paintings feature in the photographs attached, Floating and Marsh Song. When I first approached Dena and Worley about representing my work back in 2008, I just loved the esthetic of their gallery. 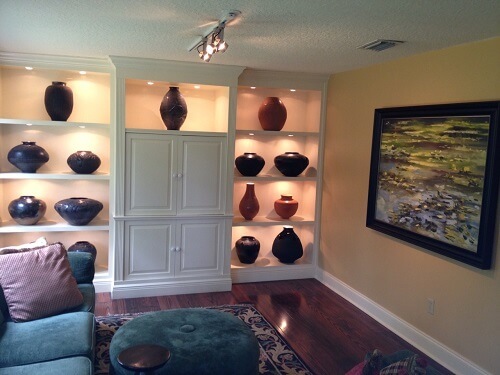 Dena had a great passion and eye for showcasing Worley’s pottery, curating their gallery and choosing wonderful antique furniture pieces or commissioned furniture by artist Richard Warholic to display and enhance the pottery. I liked the overall feel of the gallery. 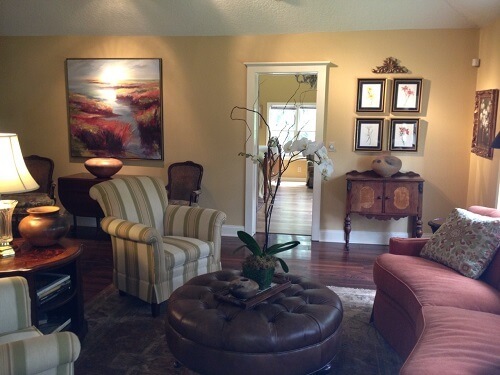 My paintings were contemporary and were a great fit, with the pottery our work successfully complimented each other. This was a unique synergy of artists promoting artists. It was a great learning curve early in my career showing my work professionally. In these early stages of my career I found it easier to talk about Worley’s work than my own. It took me a while to find my place in the art market, to feel like I really belonged. I gained much from this business connection turned friendship. Worley and Dena have been great teachers in life – one of Worley’s great quotes – “The universe has many lessons to teach, if we are calm and listen.” Still when my mind races and I impatiently want my career to go faster, higher, better, I am reminded of the bedrock of truth in this quote. Dena’s great quote – “Just Work” – even in the moments of self-doubt and despair. Many working artists are well aware of the highs and lows of this profession. Having a deep meditative approach and self-belief are at the heart of their lessons. There is a deep spiritual connection to the earth and nature and Worley often refers to the fact we are portals in the creative process, to be open and to be present and to be committed to your craft, these are just some of the aspects important in our roles as artists. They are great believers that – “All art is laughter to relieve us from life’s grief’s” – from the ancient story of Odysseus, this brings us closer to the modern understanding, that to appreciate art or practice art helps us to live our lives creatively and there are proven health benefits. Worley Faver hand build’s pottery using ancient techniques, his unique and special works of art are represented professionally by Cutter and Cutter at the “Brilliance in Color Gallery”, St Augustine. Please click on the link to be connected and view more of his magnificent work. To watch a short video about Worley Faver click on this link. Worley’s pottery has been picked up by major gallery “Brilliance in Color Fine Art Gallery” his work will now displayed in their gallery at 25 King Street. It’s great news for Worley, his work is incredible and I have had the chance to learn the method of hand building pottery from the Master. Visit the gallery and take a look at the paintings, at the once a month Art Walk. It’s a self guided tour happening on the 1st Friday of every month. We’d love to see you at 11A Aviles Street at the Worley Faver Gallery. 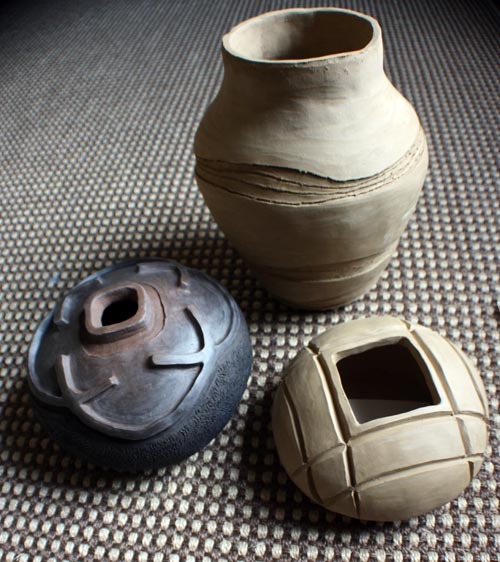 Here are a few my pots – one has been fired and the other two are still drying! This gallery closed in Feb 2013, my work is now represented by the Fairfax Gallery, Jacksonville.